In a remote region of the galaxy, the United States space tug, Nostromo, carrying a cargo of mineral ore, makes its return journey to Earth. The ship’s crew – five men two women and a cat – are awakened from their hypersleep chambers when Mother, the on-board computer, monitors a strange transmission. According to company law, the crew must investigate any signal indicating possible intelligent life. 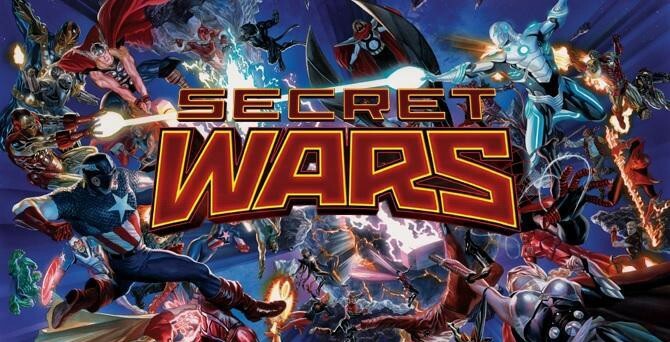 What begins as a routine search mission quickly escalates into a nightmare of unimaginable terror when the crew discovers and brings aboard an extraterrestrial lifeform. Kane, the guy who infamously had the alien erupt from his chest in an awesomely gruesome scene. This figure is insanely detailed for a 7” figure and it looks exactly like Kane did in the film, but, you know, without a face sculpt. I’ll get into that a little bit later, but first, let’s start off with the packaging. 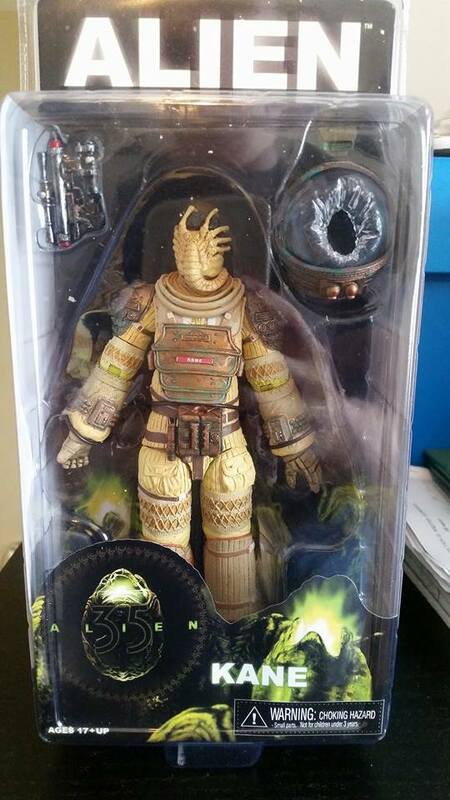 Kane comes in NECA’s signature clamshell packaging, which, in my opinion, always looks fantastic. Straight through the packaging you can instantly see Kane in his Nostromo suit with a Face Hugger firmly attached to his face. His accessories are placed nicely around the packaging and everything is in clear view. For anybody that’s nuts about their figures being mint-on-card, then this packaging is perfect. The sculpting is where this figure really shines. 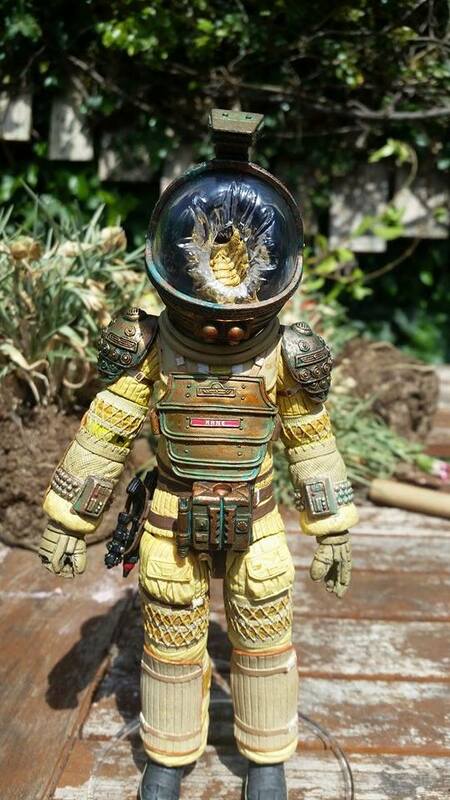 NECA pulled out all the stops to get this figure loaded with nitty-gritty details and sculptors Alex Heinke and Adrienne Smith did an amazing job capturing the Nostromo suit in all its glory. One of the first things you’ll notice on this figure is the face sculpt, or more likely the lack of Kane’s face sculpt. 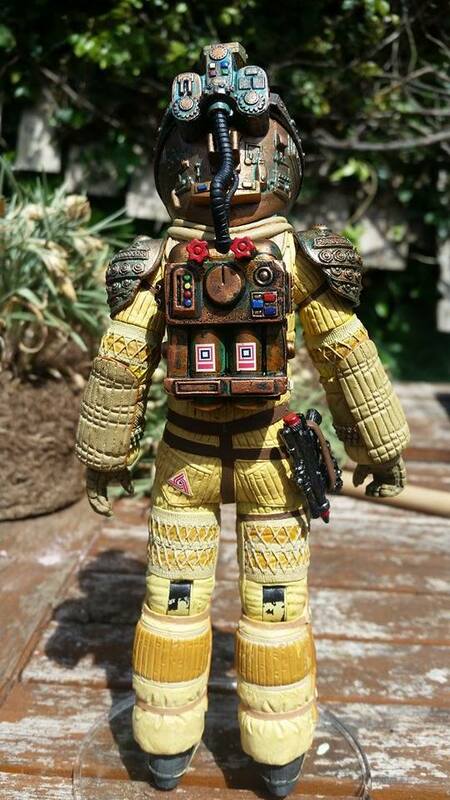 This figure portrays Kane from one particular scene in the film – when Kane inspected an alien egg and BAM! The Face Hugger leaps out and attaches itself to Kane’s face. The result is fantastic. The alien is completely wrapped around Kane’s head, and the tail coils around his neck, just as it did in the film. The spindly finger-like legs and the boney appearance of the body were captured very well. The suit itself is surprisingly realistic. It’s bulky enough to show off the padding and complexity of the suit, but the figure doesn’t look over bulky or awkward. The scenes in the film where Kane wears this suit are quite dark but NECA did a great job of bringing out the colours of the suit. The insane amount of detail on this figure compensates for the few areas this figure lacks and one of the standout pieces is Kane’s helmet. I love how NECA have sculpted it to look like the Face Hugger’s acid melted straight through the glass so it could get to Kane’s face. I want to point out one thing regarding the paint application on this figure that seems to be a common fault: stickiness. Certain parts of the figure do have quite a tackiness to them and after your first handling, don’t ne surprised if there’s some residual paint on your fingers. It is mostly from the bronze areas such as the helmet, the shoulder pads, and the air pack on his back. However, it’s not a huge fault as it seems to dry up nicely once the figure has been out of the package for a while. Other than that one minor fault, the paint is superb on this figure. There is very little slop, if any, and the end result is fantastic. The colours all blend beautifully and the bronze areas with their shades of a blue/green colour really make this figure pop. The suit looks like it’s been through it’s fair share of explorations and the paint really shows off this weathered look. 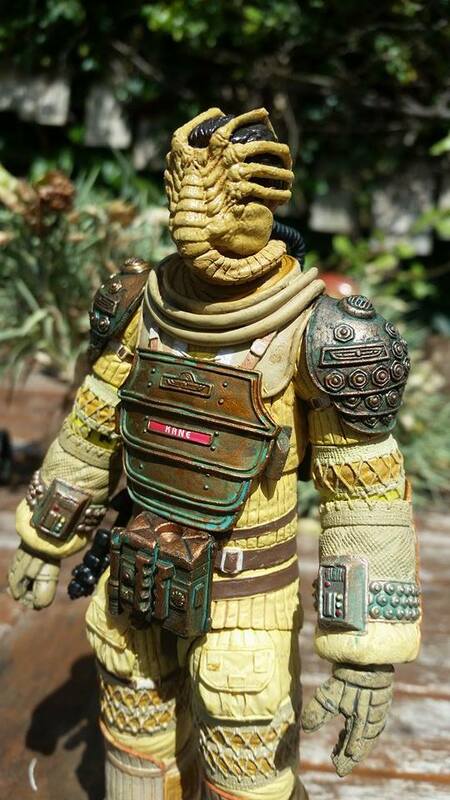 If only NECA did the articulation as well as they did the sculpt. The articulation isn’t bad, it’s just not great. Kane has a ball jointed head, waist, hips, wrists and ankles, he swivels at the biceps, elbows, knees and he also bends at the knee and elbows. Kane actually has quite a lot of articulation but the bulkiness of the suit hinders it in places. The knee and elbow bends aren’t great, with the elbows being the worse of the two by far. It really hinders the poseability of the figure, as I would have loved to see him able to reach his face as if he’s trying to get the Face Hugger off, but maybe that’s just me. The serious lack of articulation at Kane’s elbow bends can be seen in the picture below. Kane comes with a removable helmet, a torch, and a laser gun. Each of the accessories are really nice and the paint detail on them are great. However, the gun barely fits in his hand but I’m content to leave it in the holster anyway. 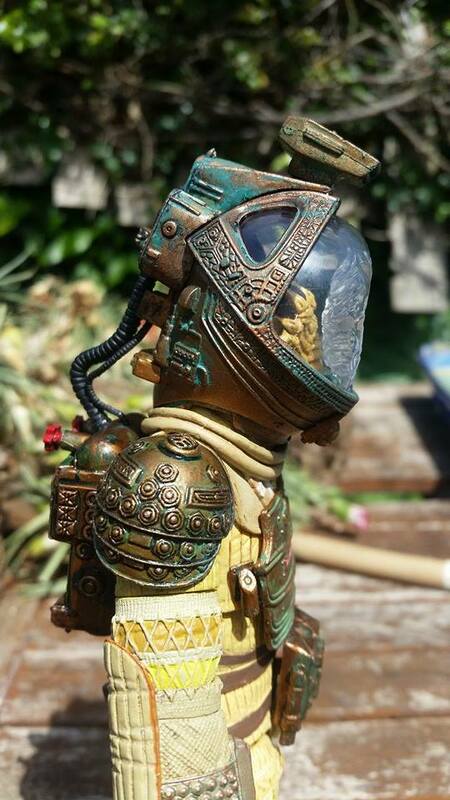 The glass on the helmet is sculpted beautifully and it looks like the glass has melted inward, which is a really nice touch rather than just an open hole. 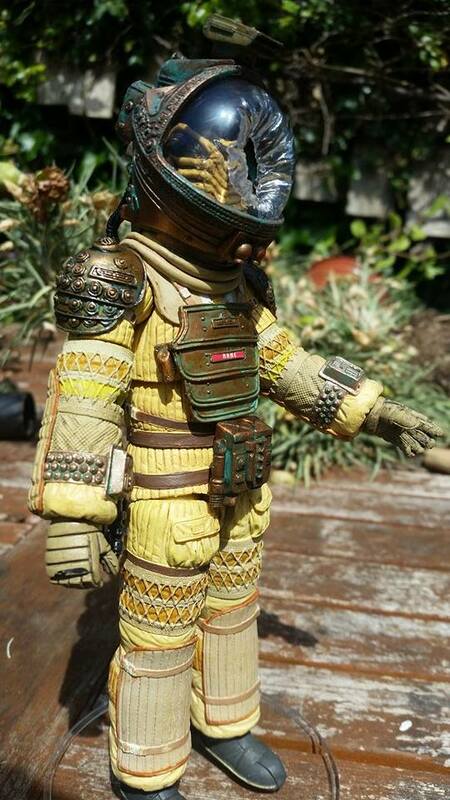 I wish NECA included an alien egg with this figure to really recreate the iconic scene, but we all can’t get what we want. This figure’s only real downside is the articulation, but even at that, the beautiful sculpt and intricate paint details make up for that flaw instantly. Kane looks amazing next to the rest of NECA’s Aliens line and it is a must have for any fan of the series.